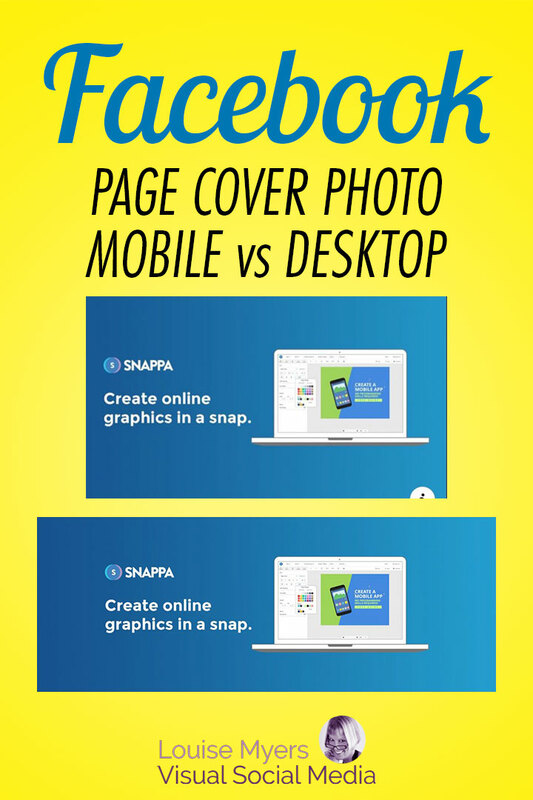 2 Great ways to make the perfect Facebook Page Cover Photo! Already know how to design with a graphics program that has layers, like Photoshop? Then you’ll love my FREE cover photo template below. Not a pro designer? No worries! There’s an EASY online design app that includes a template right inside! Read on for both of these options, with instructions on keeping your elements within the “safe zone” so it won’t get cropped on either desktop or mobile. Why Should You Care about Optimizing for Mobile? Mobile use is on the rise, and this trend will continue to grow. Google won’t like your website if it’s not optimized for mobile – and Facebook users won’t understand your cover photo that’s designed for desktop viewing! Over half – 56.5% – of Facebook users ONLY access the site by mobile (up from 51.7% in January 2016). Why is the Facebook Page Cover Photo so Confusing? Facebook Cover Photo sizes seem to be a tough concept for many to grasp. First off, there are 4 different kinds of cover photos on Facebook (see below). If that’s not confusing enough, Facebook recommends different sizes for each. BUT the problem is NOT the pixel dimensions! Issues arise because each cover photo has a different shape on desktop vs. mobile. Cover photos have a wider aspect ratio on desktop. They’re taller on mobile. This isn’t because Facebook is trying to confuse designers! It’s because a browser window is wide. A mobile device is tall. FB is trying to accommodate these completely different displays. Must be at least 400 pixels wide and 150 pixels tall. Yeah. Well that would be great if we could actually upload a separate image for mobile and desktop. But we can’t! What we need to do is design a cover photo that works for both sizes / shapes. Let me reiterate, the pixel size is not the critical issue. It’s that the SHAPES are different. You can design for desktop, and have a huge portion of the sides cut off on mobile. OR, you can design for mobile, and allow some cropping top and bottom on desktop. I highly recommend mobile-first design! As marketers, we spend a lot of time at a computer monitor. This is not the case with the general public! Over half – 56.5% – of Facebook users ONLY access the site by mobile. These folks will never see your desktop-optimized design. My templates are optimized for mobile first. *By the way, I strongly suggest you ignore any cover photo size advice from Facebook! This article applies to Facebook Business Page cover photos ONLY. Facebook Page Cover Photos made easy! Let me alleviate your confusion. It doesn’t have to be difficult. If you don’t want to mess with Photoshop and templates, make your FB header the easy way – with Snappa! 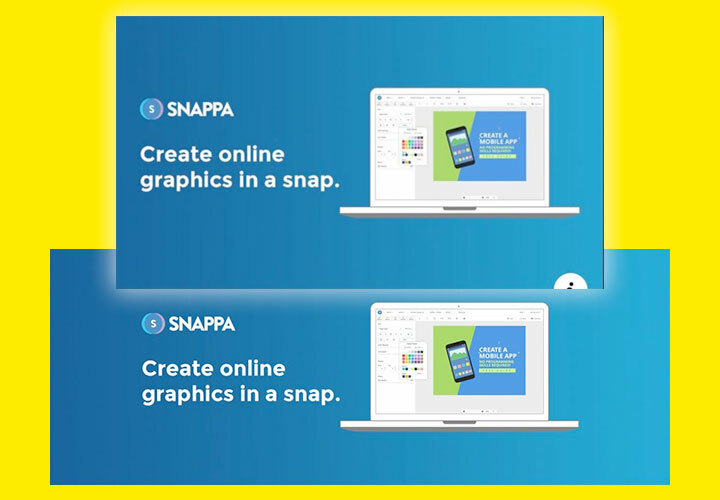 Snappa has integrated Facebook’s cover photo dimensions and safe zones into their graphic design tool, so it’ll look perfect on both mobile and desktop. Or, upload your own photos into Snappa. Or, import your own custom fonts to keep your branding intact. Read on for instructions. Or jump in and try it out now! I agree – it’s tricky to design your Facebook cover photo to display properly on both mobile and desktop. Designing with “safe zones” will get you a Facebook cover photo that looks great on all devices! Facebook doesn’t stretch and distort your image to fit different devices – it crops it automatically instead. On a mobile device, your Facebook cover photo will crop out the sides, while showing more of the cover photo’s height. And on a desktop device, Facebook displays more of your cover photo’s width, while cropping the top and bottom. You can quickly see the difference below. 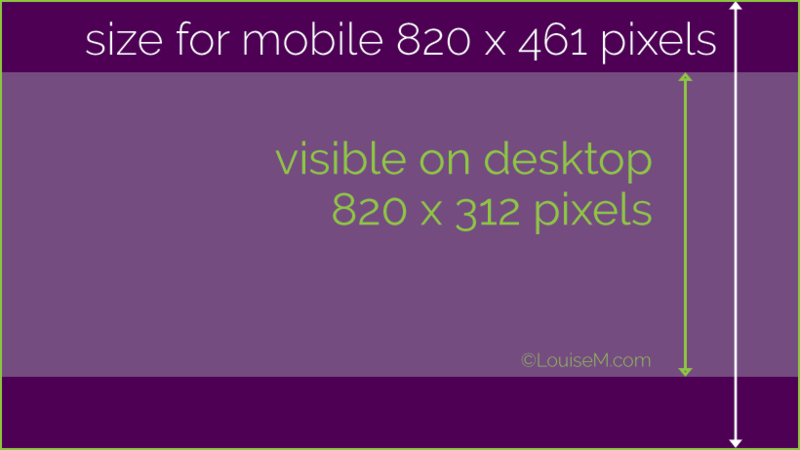 Using the Facebook cover photo size of 820 pixels by 360 pixels and keeping critical elements within safe zones will ensure that nothing important gets cut off on either mobile devices or desktop. If you’re ready to create a Facebook cover photo, Snappa’s powerful and easy-to-use graphics builder has made this process incredibly simple. Here’s a step-by-step video showing you how to create a Facebook Page cover photo in the optimal size using Snappa. Or, follow these screenshots to walk you through the process. Choose the Facebook cover photo preset for a perfect cover photo size – automatically! 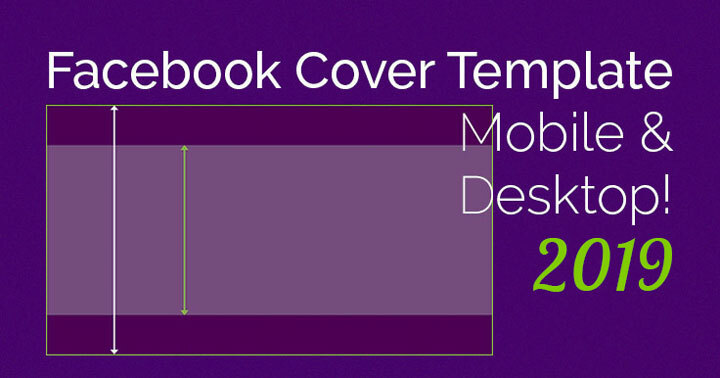 Next, choose a premade Facebook Cover template (which is fully customizable), or create a cover photo from scratch. Even if you use a template, you can upload your own image – or choose from Snappa’s library of free images. Add text, graphics, shapes, and effects to any part of the image. Your mobile Cover Photo will no longer have the sides rudely chopped off with this template. The secret is to make your image much taller than the recommended 820 x 312 pixels – 461 pixels tall, to be exact. This gives you 75 pixels top and bottom that will be cropped on desktop. I tried different aspect ratios, and this one worked best. You may lose a pixel or two on one or more of the edges on mobile. Nothing worth worrying about! I do recommend that you make your cover photo even larger than 820 pixels for best resolution. I have a template for that too! The one just below is 820 pixels wide, Facebook’s recommended width. For high-resolution version and instructions, keep scrolling! Right click to download the Facebook Cover Photo template for mobile and desktop, 2019 low-rez version. Facebook Page Cover Photo template, UPSIZED! Even better – Make your Facebook Page Cover Photo BIGGER! I recommend 1200 x 675. Right click here to download the LARGE template. This template is so close to the recommended size for link shares that you can multi-purpose it. It’s also the exact size recommended for tweeted images. The proportion is 16:9. You can find flexible social media header templates available for purchase on Creative Market. They use Photoshop Smart Objects so you can preview how your design will look on desktop, phone, and tablet. Move your images and text around and see the mockups update before your eyes! Disclosure: I’m a Creative Market affiliate and will make a small referral fee if you purchase. I believe the small cost is well worth the time you’ll save. When you upload your Cover Photo on desktop, you can adjust the top cropping so it’s positioned top-to-bottom exactly as you like it. If you upload on mobile, it will crop to center automatically in desktop view. However, I don’t recommend this, as the compression is terrible! Stick to uploading a PNG file via your desktop computer and it will look 10 times better. I recommend uploading your FB cover photo as a PNG file via desktop to avoid unsightly image compression. What Changed With Facebook Cover Photo Size 2016–2017? Fortunately, the Facebook Page cover photo size has remained stable for almost 2 years now (since Spring 2017). Spring 2016: The desktop width reduced to 828 pixels. I reduced the height for mobile accordingly. Facebook personal profiles are NOT affected. Summer 2016: There are no longer type or profile picture overlays on the cover photo! Winter 2017: The desktop size was reduced to 820 x 312 pixels, from 828 x 315. This is the same proportion! So you don’t need to redo your cover photo if it’s 828 x 315. No more type or profile picture overlays on the FB Page cover photo as of Summer 2016. 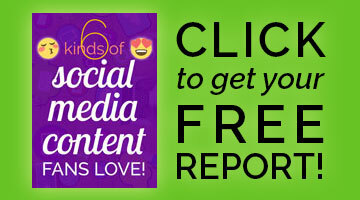 Want all the top social media image sizes? This one rounds them up for you, plus provides links to in-depth articles on many of the topics! It’s truly the ultimate guide to social media image sizes. Ready to make your Facebook Page cover photo the easy way? Whether you’re a designer or not, it’s really got everything you need. What do you think? Now your Facebook Cover Photo mobile version can rock just like on desktop! Share with a friend! thank you so much for this! it worked perfectly. It’s a toughie, and my best resource has retired from this business. I hope to find another source soon. Please help. I have tried using the 820 px 312px but it is still too big when I view on mobile device. what am I doing wrong? Deb, if you read the article and look at the template, you’ll see that that size won’t work for mobile. Follow the instructions and it will work. I don’t recommend that size. Read the article for my recommendation. I keep trying to create a cover photo for a group page, and nothing I have found is working out. Is the size different? Yes. FB cover photos for business pages (this article), groups and events are all different. And they change frequently, so I can’t verify current size for group or event. Hi Dawn, updated info and my new FB group cover template here. Thanks Louise! This works brilliantly! Hi, Louise – It seems like now the Facebook covers are being cropped from the top, rather than right in the middle, on desktop. Click on “Change Photo” and then “Reposition” to adjust the cropping. Thanks! I was struggling to make my artwork fit on all views without cropping anything and your up to date template helped immensely – thanks again! Thank you so very much, worked like a charm. Thanks for this info. Its not really a big deal if just using an image, the problem we’re having is when we use text on the image. Upload one size and it looks good on desktop but text is cropped on mobile, upload another size and its visa versa. So I guess the answer if you are using text on your cover photo is to go for 820 x 461 and keep your text within 75 pixels from top and 75 pixels from bottom. The full image should then show on mobile and the cropped image will show on desktop with all your text showing. I don’t understand what point that is. He’s only said what I wrote in the article and applied in the template. You must keep your text away from the top and bottom. Merci beaucoup, votre article a été d’une très grande aide. Really useful, thanks so much! Been having the problem of text being cut off on my cover images when viewing on a mobile device. This worked great to fix that problem! How do I remove the writing and purple background now that it fits. It does fit beautifully but I don’t know how to remove the original writing on the template. I copied and pasted my logo into the template if that helps to bring light on my situation. Hi, I just added the instructions from the free member area to the blog post. In short, you need a photo or other background to make a cover photo. The template is for guidance, not an image to use in your design. I hear ya! No one wants to get on board with this. And once you know, it’s easy! Your template and proportions match what I’ve been using for the template I created to use in PowerPoint for designing my covers. I was not aware of the whole series of changes that had been made so I really enjoyed reading about that. I noticed one comment mentioned cover dimensions for Facebook groups and I thought I would share what I’ve been using for my GB groups and it seems to work well with dimensions of 784 x 250. Thanks Susan! Is that size still working OK? It seems the size changed very recently, maybe even today. Right now I see approximately 2.5 times as wide as tall. 1025 x 415 on desktop. Thanks for the template and suggestion to go bigger so it suits mobile and desktop. Just wondering what your experience is with FB video? Sizing? Format? Also, I uploaded my image and then the next day FB had decided to delete it and has again. Any ideas why that would be? I don’t use video, but the 16:9 proportion should fit perfectly on mobile. The dimensions for the Facebook group cover photo don’t work at all now. Does anyone know what are the new group cover photo dimensions for desktop? Hi, updated info and my new template here. Thanks for this tutorial. I have just one question. In the page where I’ve uploaded the cover with your dimensions but the image on the page look a little blur (in mobile naviagiont)…but when i click on it I can see properly. Why this? How can I fix it? This happen also with the dimensions given by Facebook. I use a retina display on smartphone. Probably a separate preview image that FB creates to load faster. Doubt there’s anything you can do about it. Shouldn’t it be 820x 462 for mobiles? You can do that if you like. Basically I’m following a 16:9 proportion. It might not be *exactly* 75 off the top and bottom, but close enough. Thanks very much Louise. This is VERY helpful information, and especially great that it’s so current. FB seem to be changing things around regularly. Keep up the great work. Cheers from New Zealand. the size you have described are perfect. Now I am able to set my Favourite picture in cover picture. Thank you so much for this post. Great work keep it up..!!!! Thank you for your directions. I have been doing this for a while but never had a client banner that had to fit mobile before. Your instructions worked perfectly! The banner now looks good on mobile with all pertinent images within the viewing area. I can’t wait to explore the rest of your site. Any one have any suggestions on a particular photo editor that I can install on my desktop to do this? GIMP is a free photo editor that works like Photoshop, so it would be able to do this. Steep learning curve though. MANY thanks for all the tips and tricks – they are invaluable! You’d have to try a PNG file and see what happens. PNG-24 has the highest resolution, however in the past I’ve tried this and cover photos still get compressed by Facebook. Used to work great for image posts though. If it’s only flat colors you could try a PNG-8 file which will be a small file size. Thank you. Seems like we’re on the same page. My biggest reason for using jpegs is file size, yes. And I reckon that FB wouldn’t be too keen to help us upload high res images – or rather, hand out the how to’s. I’m in South Africa, so I wouldn’t be surprised if there’s a difference in the compression. The business page works perfectly with the above 1200 x 675 template however the personal page just would not show clear writing like the business page.. exact same image. So I re-saved it as 851×479 and the writing suddenly became crystal clear.. I have no idea why but FB must do something to the personal one that it doesn’t on the business page banner??? Thanks this saved me a ton of hassle! I have no issues with the image height but on desktop the image is great but viewing on mobile is very different with text being cut off on both sides. Is there a limit on how wide the image should be (it seems as if the image is not being re-sized once in mobile format). It’s all about the proportions, or aspect ratio. If you use a shape that works for desktop, then the sides will be cut off on mobile. I recommend using a shape that works best on mobile and allowing the crop top and bottom on desktop. Have you tried the template? Thanks for the reply, I haven’t tried the template yet but will give it a go today. THANKS, finally, I have been editing that facebook cover from 851 x 315 to 820 x 312, and the mobile version is still CROPPED. GODDAMIT. THANK YOU SO MUCH! There isn’t one size that looks the same across all devices. Thanks! This aspect ratio is just what I was looking for.. Thank you so much. This was exactly what I needed and it worked perfectly! I know I am not dumb, but I cannot get my cover photo to properly show even when following the template. It shows fine on my desktop, I cannot get it to appear properly on my mobile. Can you explain what you mean by “properly”? I see the full image on mobile and cropped on desktop. How do you use the template? For FB cover photo …. Need something that works for both desk top and mobile. Hi Louise, I followed the instructions you gave but I think I am still doing something wrong. I am not very computer savvy……. My question is – do I have to upload the image using a mobile device if I want it to fit on a mobile device? No, I recommend uploading on desktop as mobile compresses the image even more. As long as you’re using the overall size I recommended, it doesn’t matter what program you use. Sounds like you’re using the desktop size. I suggest you reread the article on why that won’t work for mobile. Thanks Louise! Brilliant and easy instructions to follow. Thank you thank you thank you! Have been looking for something like this for a while! It was too small, or too big? The template is larger than that – 2560 × 1440. Same proportions as 2048 x 1152! Still finding 2560 × 1440 to be the recommended optimal size. What size was your upload? “For the best results on all devices, we recommend uploading one 2560 x 1440 px image.” Direct from YouTube. Yep, Google announced early last year that they would shut down G+ this year.